SAN DIEGO – There were two collisions involving deer in San Diego County early Monday morning, including A California Highway Patrol SUV carrying two officers that slammed into a deer on Interstate 5 amid heavy fog. 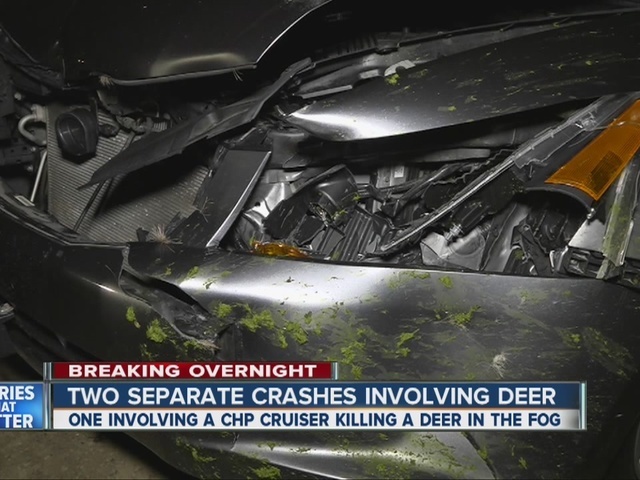 At around 2:30 a.m., the patrol vehicle was responding to a crash when it in collided into the deer in the middle lanes of northbound I-5, north of Sorrento Valley. Officers said the deer was standing in the middle of the freeway. The officers were not hurt, but the collision caused major front end damage to the vehicle. At the time, the CHP cruiser was headed to a rollover crash that had occurred on southbound I-5 at Carmel Mountain Road in which one person was taken to a hospital with minor injuries. Meanwhile, sometime before 3:45 a.m. a car struck a deer on State Route 52 and Mast Boulevard near Mission Trails Regional Park. The driver said the deer ran out in front of his car. "And after I hit it, my car became disabled,” driver Fares Ibraham told 10News. “I just couldn't do anything. I just didn't see it. I don't know what happened to the deer." Ibraham was not hurt. He said fog was not a factor in that crash.